(From left) State Archivist Adam Jansen, Gov. David Y. Ige, and Chief Information Officer Todd Nacapuy share an update on the state’s paperless initiative prior to Gov. Ige “eSigning” the Digital Records Day proclamation. HONOLULU – With a single tap on a Microsoft Surface Pro, Gov. David Y. Ige today proclaimed October 10, 2016, Electronic Records Day in Hawaii, electronically signing the ceremonial proclamation using the State of Hawaii’s “eSign Service” solution that the governor’s office piloted one year ago. 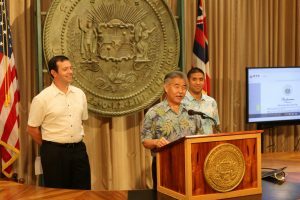 It is Hawaii’s first “paperless” proclamation by a governor. On Oct. 1, 2015, the Office of the Governor, with assistance from the Office of Enterprise Technology Services (ETS), piloted the use of eSign Service, processing all documents electronically to the extent possible. Departments were instructed to submit documents for the governor’s signature using an electronic routing form template. In the first three months alone, there were 2,337 eSign transactions. ETS has since expanded the service to departments statewide to increase government efficiency within the executive branch. As of today, more than 64,000 (and counting) unique electronic transactions have been processed across departments, representing a reduction and associated savings in the use of paper, ink, and process time. For example, without eSign, the average time for a state document to be signed was between four and 12 days. With eSign, that average is between 129 and 181 minutes. Accelerated signing dramatically reduces the time that employees spend on paperwork overall. For instance, newly hired government employees, who once spent 2.5 hours filling out onboarding paperwork on their first day, can now complete the process online in less than 30 minutes and from anywhere. Another area of opportunity is presented by the fact that state employees must sign an average of 30 documents a year, from annual tax documents to updated acceptable use policies — a process that can be greatly streamlined. In addition to gained efficiency, there are environmental benefits. According to the Adobe ResourceSaver Calculator, signing 64,000 documents electronically instead of on paper saves 23,840 pounds of wood, 73,132 gallons of water, and 6,150 pounds of waste.